If you strive for a mirror finish, you’ll love Mothers Clay Bar Paint Saving System – now with 2 clay bars! Mothers has upgraded their popular Clay Bar Paint Saving System to include 2 clay bars and a soft microfiber towel! Use Mothers detailing clay to remove impurities that washing leaves behind. With double the clay, you can clean 6 regular size cars with one Mothers California Gold Clay Bar Paint Saving System! 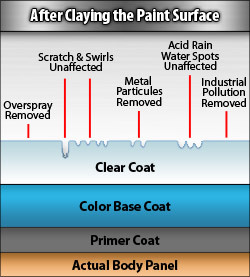 Detailing clay is the only way to remove embedded contaminants from automotive paint. 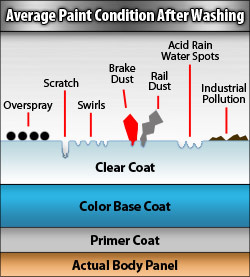 Microscopic contaminants – like rail dust, industrial fallout, and brake dust – penetrate and weaken the paint. Mothers detailing clay removes these contaminants to leave the paint silky smooth and totally clean. You might be wondering why you should consider using a clay bar. To determine if you need a clay bar, first, rub your hand along the freshly washed painted surface of your car. Feel any gritty residue? If the surface is not perfectly smooth; you need Mothers Clay Bar. Remember, no matter how often you wash your car; the paint is only as clean as the soap is powerful. And no soap alone can do what Mothers Clay Bar Paint Saving System does. The cleaner the painted surface, the more effective your waxing efforts will be. Minute particles and dirt fragments will obscure even the most expertly applied wax. Your car will have a deep, wet shine, free of all contaminants, when you wax over a surface prepared used the clay bar. Imagine, even if you are extremely cautious when waxing your car, trace amounts of dirt residue leftover from washing, can get caught in your wax, causing the particles to become embedded within the wax finish. It is these small contaminants that Mothers Clay Bar was developed to remove. This is a medium grade clay causes a gentle shearing action that removes stubborn contamination from the paint surface and leaves the finish feeling unbelievably smooth. The exclusive Paint Saving System will remove tree sap, airborne deposits, grains of metal (industrial fallout), and paint over spray. Each synthetic clay bar is a moldable compound that grabs tiny contaminants as you drag it across the paint surface. It is nonabrasive, contains no chemicals, and will not alter the paint in any way. Even though it sounds tough, and it is, Mothers Clay Bar is completely paint-friendly. You can use it with confidence no matter what your level of detailing experience. Used a slick clay lubricant, Mothers Showtime Instant Detailer provides a thin, slippery barrier between the clay and the paint to prevent scratching. Though the clay itself poses no risk to your paint, the contaminants that have become caught in the clay could scratch the paint without proper lubrication. You can also use Showtime to give clean up any clay residue and as a quick detailer. Mothers microfiber towel is a strong but soft blend of polyester and polyamide. Use the towel for wiping the paint clean after using Mothers clay bar and Showtime Instant Detailer. Wash the towel with Pinnacle Micro Rejuvenator to maintain its softness. Mothers Clay Bar Paint Saving System is easy to use. The yellow clay has a soft yet firm texture that will not crumble as you use and re-form it. The first step to a glass-like finish is to thoroughly wash and dry your car. Work on small sections at a time, spraying first with Showtime and then moving the clay bar across the surface in a back and forth motion. Don’t use a circular or swirling method when applying the clay. You may notice a gritty resistance and sound. This is normal and will stop as the surface is cleaned. Once the clay moves without any resistance the surface is clean. Now feel the paint surface, you’ll be awed by how much smoother it has become! Move on to the next section, always remembering to slightly overlap the previously clayed area. You will begin to see a reddish brown deposit residue forming on the clay bar. This is the grime being trapped within the clay and away from the paint surface. As the clay bar becomes soiled, fold it over itself and reform the sections to reveal unsoiled clay. Don’t forget to always keep the surface wet with Showtime Instant Detailer while using the clay bar. Follow the clay treatments with polish and wax. Showtime can be used between washes as an instant detailer. Mothers California Gold Clay Bar Paint Saving System will uncover a new depth of shine, with enhanced clarity. Use it twice a year to maintain a smooth, healthy paint. Great product. I can say I have been very happy with everything I have got from you guys. I will buy from you guys for life. ProsI can say I have been very happy with everything I have got from you guys. I will buy from you guys for life. Cons You guys charge more than the competition don't ever trust these people they do not price match I will never buy from auto geek again !! Haven't used other clay bars but this works great. I was a bit confused that there is instant detailer in the package and not a special clay lube, but it works perfectly. Tip: apply it to your windows and rims too - you will be amazed. Been using the product for years and love the results. No need to try anything else. Consistently good.